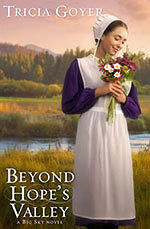 Having reviewed the first two books in the Big Sky novel series by Tricia Goyer, I was anxious to review Beyond Hope's Valley. After an extended stay in Montana, where Amish traditions are different than in her home state, Marianna Sommer returns to Indiana for two reasons, first to help her brother and his girlfriend prepare for a baby and their wedding. Second, to plan her own wedding to Aaron Zook -- a marriage she’s been dreaming about ever since childhood. And yet, although she had missed the idyllic farms and families of her upbringing, Marianna is surprised that Indiana is somehow making her long now for Montana. As months pass, secrets that were hidden in winter’s frozen grasp thaw and take on a life of their own. The truths about a child, about a past relationship, and about God’s plans are being revealed. Walking through a valley of questions, Marianna must hold on to hope as she decides where and with whom her heart truly belongs. The book was fabulous. Tricia writes characters that feel real, and she paints places so I can almost smell them. That being said, I'm just not sure this book would stand alone. I highly recommend it, but I think that starting with Beside Still Waters would make more sense. While I loved reading Marianna's story, I also really appreciated the story of her mother, Ruth. I felt like I really understood her by the end of the first book, but she continued to surprise and inspire me. About Tricia: Tricia Goyer is the award winning author of thirty-two books including Beside Still Waters, Remembering You, and the mommy memoir, Blue Like Play Dough. Tricia is a regular speaker at conventions and conferences and is the host of Living Inspired. She and her family make their home in Little Rock, Arkansas where they are part of the ministry of FamilyLife. More info: Living Inspired and www.triciagoyer.com. 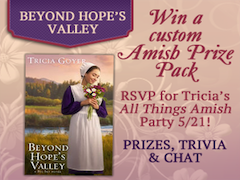 Celebrate with Tricia and enter to win a custom-made Amish Wall hanging in the colors of your choice ... and much more! Enter today by clicking one of the icons below. But hurry, the giveaway ends on May 20th. Winner will be announced at "All Things Amish" Author Chat Facebook Party on 5/21. Tricia will be hosting an author chat (on Facebook and Live from her website) and giving away books, gift certificates and more! Don't miss a moment of the fun. RSVP today and tell your friends via FACEBOOK or TWITTER and increase your chances of winning. Hope to see you on the 21st!